When first researching the Koolie back in ’85, there was nothing about the breed; you learned about them by getting to know those who bred them, farmers, stockmen (and most were in their 70s), and your own efforts. Slowly over the years, I have compiled Koolie information and presented it to the general public through countless Koolie-friendly websites. The majority of information on the Internet today came originally from me or through the Koolie Club of Australia, so here's the most current information my research has uncovered. Note: the information on this page is free to use but please include my name, Kerrie Challenger, as the author. This has to be one of the most confusing and useless hurdles for the Koolie as a re-emerging breed to overcome: its name. The name of the Koolie has caused splits and arguments between groups who wish to keep the breed’s name as German Coolie and those who wish to acknowledge the breed’s origins as Australian and use the name Australian Koolie. So, in the hope of resolving a very confusing issue for the general public, here are the facts on the Koolie’s name. Originally, shortly after the breed’s formation back in the early 1800s, these dogs were mistaken for a German’s Collie, because many German shepherds used regional types of sheepdogs. These dogs appeared and currently appear in different sizes and colours. The merle dogs are called Tiger. They mostly were medium sized like a Collie and had short, medium, long or curly coated hair. Then we have the traditional name. The breed was known as "The Germans Koolie" which was over time shortened to German Koolie. Fact 2. Upon asking an Alpine German farmer to pronounce the written word “Collie” I was not surprised to learn it sounded like “Koolie.” So we have a mispronunciation of the word Collie and everyone is calling them Koolies. In several news clippings of that era, the two names are confused, even at times both names appear to identify one dog. As for the spelling, it is only in recent times the need to write the word regularly has arisen, so many spelled it with a (soft) "C" while others spelled it with a (hard) "K." Note: there is no soft "C" in the German alphabet. Fact 3. In the 2000 abridged version of A.J. (Bert) Howard’s book, “Over Hauling the Colony” originally written in 1990, Bert writes and “The word "Collie" had its origins in the Icelandic and Germanic languages from the word KOL meaning black, or the colour of a piece of fuel. From this evolved the word COAL. The hardy breed of small, black-faced sheep in the Scottish Highlands were called COALY sheep because they had coal coloured faces. Therefore the breed of dogs that worked these sheep were called COALY DOGS. Over time this has changed to become Collie Dogs.” However, as previously stated in his book, “the dogs used by shepherds in the Scottish border regions and Highlands, working Cheviot sheep, were known as the Shepherd’s Dog, and the dogs used by drovers were known as the Drover’s Dog, etc. (This was also the case in colonial Australia.) They named their working dogs according to the work done by that particular dog. “The Drover's Dog of Northumberland was often referred to as the CUR. However, the word should not be confused with modern connotations. The Icelandic and Germanic languages had the words KUR and KURRE which described an important dog used for guarding property and stock. Their language came to Britain in ancient times. Over a long period the English usage changed. The letter K gradually gave way to be replaced by the letter C. Therefore KUR or KURRE became CUR in the English language." So, looking back through history and the English settlers’ influence upon the German language, it is not surprising to see the same thing has occurred here in early Australia. 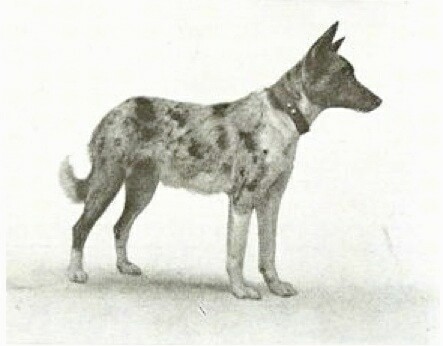 Put simply, the English spell everything with a soft "C" while the Germans maintain and continue to use the hard "K."
In conclusion, if we were to use the true traditional name for the Koolie it would be spelled with a "K," as everyone believed this breed’s origins were German, hence it would have been known as a German Koolie. However, the Germans deny there ever being any Collie bloodlines in Germany. Therefore, you have an Australian breed incorrectly named, because of the mispronunciation of the word Collie, and the influence of the English over time on the letter K. Note: Germany had nothing to do with the Koolie, other than the German Tiger’s influence as an ancestor. So why continue to incorrectly name a breed that originated in Australia? 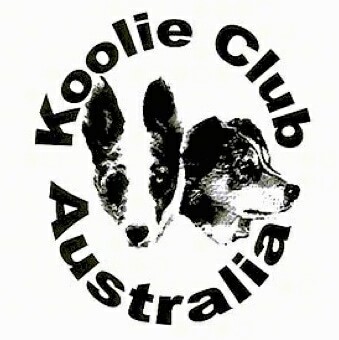 In April of 2000 the Koolie Club of Australia, in order to register and run the legal/official side of the newly launched club, adopted the name Australian Koolie to acknowledge the breed’s origins and used the hard "K" to avoid the breed being mistaken as a misspelling of the word Collie and to recognize the German Tiger’s influence in the formation of the breed. The club makes no demands on their members to follow this spelling, saying it is each person’s right to spell the name as they choose, but when registering their litters they always write Australian Koolie. Fact 4. If a person was to DNA their German Koolie/Coolie and the dog carried the Koolie signature gene then their test results would confirm that their dog, no matter what they chose to call it, would be recognized by its own DNA as an Australian Koolie. When you find a breed that can produce so many traits and colour/type variations it is easy to get stuck on a favorite or even get overwhelmed. Most people recognize the merle colour/pattern of the Koolie breed; it is still the most requested colour, but what many people new to the breed are shocked to learn is that the merle gene is the only colour/pattern gene that can impact upon the physiology of the dog as well. In the hands of an inexperienced breeder this can lead to a lot of heartache. So a little colour knowledge is a good thing. Fact 1. Breeding merle to merle carries a high risk of breeding deaf and/or blind pups. It is not a matter of when will it happen, it is more a question of how many pups will be affected and how badly. The worst case of merle to merle breeding I have seen resulted in a pup that was totally deaf and born without eyes. Others can have myopic (small) eyes, star burst eye, (no pupil), elevated eyes (turned up), some can have the third eyelid still extended over the eye, partially formed eyes, empty opened sockets or a range of problems with vision, lessened, obscured, double, fractal, etc. Fact 2. The Koolie can carry a dilution gene which will change a chocolate/red dog to tan/fawn and a black dog to grey/blue or slate. In the merle the dilution gene affects the pattern colour, changing it from black or chocolate to grey or fawn. Note: the Koolie Club of Australia encourage breeders not to breed from a Koolie carrying the dilution gene. Fact 3.The Koolie can carry the E Loci masking gene which changes the coat colour of a chocolate dog to cream/yellow. Note: until more is known about the effects of either the dilution gene or the E Loci masking gene I will in future check the DNA of every Koolie pair I intend to mate and choose not to breed from those who carry these genes with other Koolies carrying the same genes as a precautionary step in our efforts to breed healthy, balanced Koolies. Fact 4.The Koolie can carry the merle gene but not display it and appear as a solid-coloured dog. These Koolies are called cryptic merle and in a merle-to-merle mating can still produce defective pups. Fact 5. The Koolie is and always has been an intelligent, healthy, loyal, hardworking breed, bred for agricultural work, with abilities that see it just as comfortable in service, sport and companion roles. The nature, biddability and character of the Koolie is what sets this breed apart, not its different colour/coat types. By focusing on any one trait/colour, placing it above the rest, we breed the Koolie out of balance. We only need look at our own recognized purebreds of the show ring and see what focused breeding has done to them; not only increased the number of life-threatening genetic inherent diseases but shortened their lives, where getting to ten is a celebration of longevity. Fact 6. A defective Koolie is normally white, but it has been recorded that merle deaf/blind defects can also occur in strong-coloured pups from merle-to-merle mating. Fact 7. A Koolie with a white base coat colour, regardless of how strong the merle pattern colour might be, is called a double merle because it carries one set of merle genes from each of its parents. 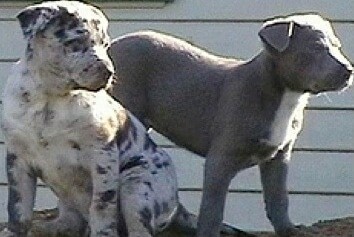 These Koolies are the highest risk for breeding defective litters if bred back to a merle. Fact 8. For the safest results in breeding healthy Koolies, a solid colour DNA tested for the merle gene to a merle is encouraged. Fact 9. Before 2000, over half of the solid, bi- and tricolored Koolie pups were either put down by breeders or sold off as Kelpies or Border Collies, while others were just dumped in the pound. Since the launch of the Koolie Club of Australia in 2000 the number of breeders adopting safe breeding practices has risen, resulting in fewer solid colour dogs being lost. A safe mating using a solid Koolie will, on average, produce two-three solid colour pups, including bi- and tri-; the rest will be merle. Fact 10. The market is run by the demand of those who wish to buy. Those who truly value the Koolie breed go in search of the best Koolie they can find to meet their needs. Not because they have a pretty coat. 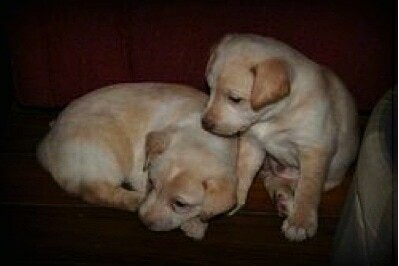 We believe in our bloodlines and will never sell a pup just for profit. We will place our Koolies into the best homes that meet the needs of the Koolie breed. 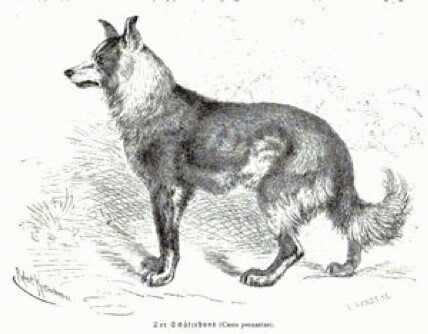 One of the ancestors of the Koolie were potentially the German Tiger a German working breed which is part of the Old German Sheepdogs; merle in colour with a short, medium, long or curly or rough coat; transported to Australia in 1836 for stock work. 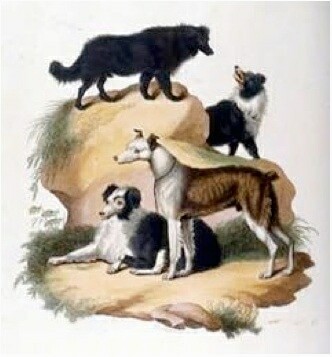 Another ancestor of the Koolie is the smooth-coated Collie from the highlands of Scotland which were merle, black and tan and solid black in colour. They were transported to Australia in the early 1800s for stock work. The Koolie has been traditionally bred to meet the demands of the grazier, stockman and drover to move all stock and to be a close companion to its human partner. Today Koolies are used in search & rescue, alert dogs for seizures, human assistance dogs, customs, all sports and family companions, but their strength and value remains on the farm. The Koolie will head (move to the front or head of the stock to push them back toward you), heel or drive (push the stock from behind), cast (move out and around the stock), block (hold the stock or block them from in front; in three sheep trials this action is called the pickup) and back (literally jump onto the backs of their charges to herd them if necessary). Koolies have a reputation for being upright workers with a good eye, who can easily shift their focus from holding the group to casting around a flock or gathering breakaways. They are not known for having "sticky eyes" (focusing on the sheep in front only). Unlike other working breeds, which are noted for their crouched form or style and preference for either yard or field work, Koolies are at ease working in closed surroundings such as yards or trucks and being out in paddocks and droving. As well as working anything from ducks to bulls, like all dogs of their kind, they will herd family members and children in the absence of other charges. The Koolie coat ranges from short/smooth (like that of the original blue merle Collies from Scotland) short (like a working Kelpie) medium (like the German Tiger) and not common long (like the show Border Collie). Koolies are typically slightly longer than tall. The majority of owners prefer the short/smooth coats as they do not pick up grass seed, bur and are very easy to maintain, with the occasional swim to keep the coat glossy and free of parasites. Koolie colours can be solid (all one colour black or red/chocolate; this includes Koolies that are cryptic merle: carry the merle gene but do not display it obviously) bi (black and white or red and white) tri (solid red or black with white markings, normally with brown points) or tri merle (same description but merle) merle (grey, black, red/chocolate or white undercoat with large splashes of darker colourings of red/chocolate for red merles or black, grey for blue merles). 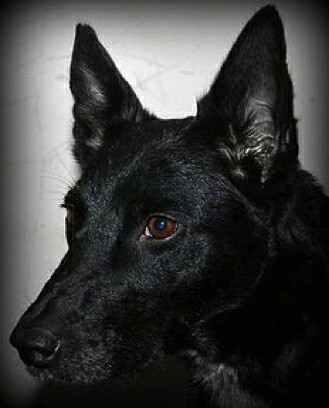 Black Koolies will commonly have a black nose with black eyes, or tones of black including blue. Red/chocolate Koolies will commonly have a red/chocolate nose with brown eyes, or tones of brown, including yellow and there can be combinations of both black and brown with the added blue eye. Committed to its human partner above all else. Tolerant of all species when raised or socialized with them. Requires mental stimulation and regular lengthy contact with its handler.